The question of normalization occurs as soon as you raise the issue of controls or comparing any two samples. You have to take it in to account when doing any type of comparision, really, so it’s somewhat important as the backbone to any good second-gen work. The most common thing I’ve heard to date is to simply normalize by the number of tags in each data set. As far as I’m concerned, that really will only work when your data sets come from the same library, or two highly correlated samples – when nearly all of your tags come from the same locations. However, this method fails as soon as you move into doing a null control. Imagine you have two samples, one is your null control, with the “background” sequences in it. When you seqeunce, you get ~6M tags, all of which represent noise. The other is ChIP-Seq, so some background plus an enriched signal. When you sequence, hopefully you sequence 90% of your signal, and 10% of the background to get ~8M tags – of which ~.8M are noise. When you do a compare, the number of tags isn’t quite doing justice to the relationship between the two samples. So what’s the real answer? Actually, I’m not sure – but I’ve come up with two different methods of doing controls in FindPeaks: One where you normalize by identifying a (symmetrical) linear regression through points that are found in both samples, the other by identifying the points that appear in both samples and summing up their peak heights. Oddly enough, they both work well, but in different scenarios. And clearly, both appear (so far) to work better than just assuming the number of tags is a good normalization ratio. More interesting, yet, is that the normalization seems to change dramatically between chromosomes (as does the number of mapping reads), which leads you to ask why that might be. Unfortunately, I’m really not sure why it is. Why should one chromosome be over-represented in an “input dna” control? Either way, I don’t think any of us are getting to the bottom of the rabbit hole of doing comparisons or good controls yet. On the bright side, however, we’ve come a LONG way from just assuming peak heights should fall into a nice Poisson distribution! >Ok, I sent a tweet about it, but it didn’t solve the frustration I feel on the subject of SNP/SNV callers. There are so many of them out there that you’d think they grow on trees. (Actually, they grow on arrays…) I’ve written one, myself, and I know there are at least 3 others written at the GSC. Anyhow, At first sight, what pisses me off is that there’s no standard format. Frankly, that’s not even the big problem, however. What’s really underlying that problem is that there’s no standard “minimum information” content being produced by the SNP/SNV callers. Many of them give a bare minimum information, but lack the details needed to really evaluate the information. quality: give me something to work with here – a confidence value between 0 and 1 would be ideal… but lets pick something we compare across data sets. Giving me 9 values and asking me to figure something out is cheating. Sheesh! Really, most of the callers out there give you most, if not all of it – but I have yet to see the final “quality” being given. The MAQ SNP caller (which is pretty good) asks you to look at several different fields and make up your own mind. That’s fine for a first generation, but maybe I can convince people that we can do better in the second gen snp callers. Ok, now I’ve got that off my chest! Phew. >I don’t know if anyone out there is interested in joining in – I’m starting to work on a database that will allow me to store all of the snps/variations that arise in any data set collected at the institution. (Or the subset to which I have the right to harvest snps, anyhow.) This will be part of the Vancouver Short Read Analysis Package, and, of course, will be available to anyone allowed to look at GPL code. I’m currently on my first pass – consider it version 0.1 – but already have some basic functionality assembled. Currently, it uses a built in snp caller to identify locations with variations and to directly send them into a postgresql database, but I will shortly be building tools to allow SNPs from any snp caller to be migrated into the db. >You know what I’d kill for? A simple set of tests for each aligner available. I have no idea why we didn’t do this ages ago. I’m sick of off-by-one errors caused by all sorts of slightly different formats available – and I can’t do unit tests without a good simple demonstration file for each aligner type. I know Sam format should help with this – assuming everyone adopts it – but even for SAM I don’t have a good control file. I’ve asked someone here to set up this test using a known sequence- and if it works, I’ll bundle the results into the Vancouver Package so everyone can use it. Here’s the 50-mer I picked to do the test. For those of you with some knowledge of cancer, it comes from tp53. It appears to blast uniquely to this location only. >how recently was your sample sequenced? >One more blog for the day. I was postponing writing this one because it’s been driving me nuts, and I thought I might be able to work around it… but clearly I can’t. With all the work I’ve put into the controls and compares in FindPeaks, I thought I was finally clear of the bugs and pains of working on the software itself – and I think I am. Unfortunately, what I didn’t count on was that the data sets themselves may not be amenable to this analysis. My control finally came off the sequencer a couple weeks ago, and I’ve been working with it for various analyses (snps and the like – it’s a WTSS data set)… and I finally plugged it into my FindPeaks/FindFeatures pipeline. Unfortunately, while the analysis is good, the sample itself is looking pretty bad. 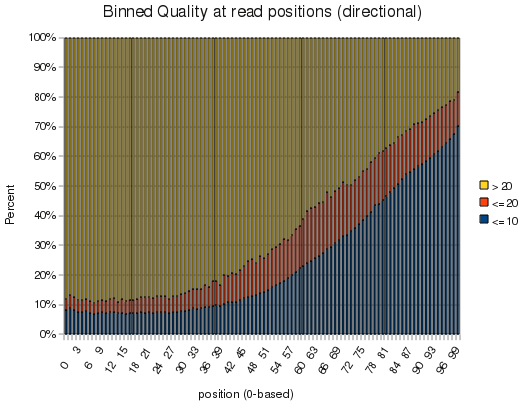 In looking at the data sets, the only thing I can figure is that the year and a half of sequencing chemistry changes has made a big impact on the number of aligning reads and the quality of the reads obtained. I no longer get a linear correlation between the two libraries – it looks partly sigmoidal. Unfortunately, there’s nothing to do except re-seqeunce the sample. But really, I guess that makes sense. If you’re doing a comparison between two data-sets, you need them to have as few differences as possible. I just never realized that the time between samples also needed to be controlled. Now I have a new question when I review papers: How much time elapsed between the sequencing of your sample and it’s control?